Like all Koreans, food was very important to my family when I was growing up in Los Angeles. No birthday morning went by without seaweed soup for good luck and every Lunar New Year was rung in with the meaty broth of a rice cake soup. Meat was even more important because our family was in the meat processing business. 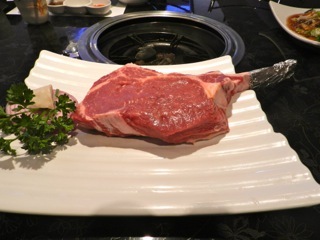 And after traveling the world looking for the best beef, I’ve come to appreciate Piedmontese cattle so much that I introduced it at my restaurant, Star King Korean BBQ, the only Korean barbecue where you will find it. The huge Piedmontese cattle are virtually fat-free, yet extra tender and tasty. What sets this breed apart is a unique genetic strain, the inactive myostatin gene, which provides a higher lean-to-fat ratio, less connective tissue in each cut, and therefore less marbling. Because the myostatin gene doesn’t prevent muscle development, a condition called “double muscling” results — muscle on top of muscle. This also results in meat that is lower in fat and calories, higher in protein while containing a higher percentage of healthy Omega 3 fat. I also love Piedmontese because its tenderness applies to the whole animal, allowing otherwise underutilized cuts to shine in interesting ways. Piedmontese have been raised in the Midwest since the early 1980s, after a group of ranchers discovered them in the north of Italy. The cattle migrated to Piedmonte in the north of Italy 25,000 years ago from Asia and became beloved, working animals. Today, the roughly 15,000 Piedmontese heads in North America account for less than 1% of all cattle. 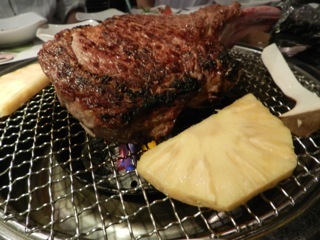 The beef is slightly more expensive than prime and less than American Wagyu and Japanese Kobe. Admired by even Italian breeders for their humane breeding, domestic Piedmondese are free-range, grass-fed, and free of antibiotics, steroids, and growth hormones. Piedmontese tastes fresh, clean, textured and tender. From national food critic to new customer, everyone marvels that the taste is purer and sweeter than all grass-fed beef, while it is just as nutritious. The dramatic Tomahawk, named for its shape and weighing in at a hefty two pounds or more, is our star cut, along with the tartare (Yuk Hye), and the classic ribeye, brisket and short ribs. Tongue and intestines are also new options, already popular among Koreans. And, of course, no Korean menu would be complete without the popular bulgogi thinly-sliced meat and galbi marinated ribs. Although Koreans are known for our miracle marinades (with up to 30 ingredients in them), Piedmontese beef requires none. It is so tender that a thin brisket cut requires nothing but 2-3 minutes on table grills over soot, an imported coal which keeps the air clean. 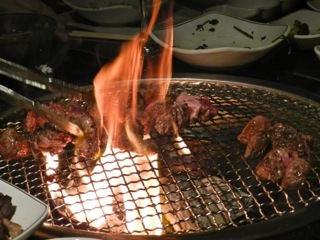 A Korean barbecue featuring grilled Piedmontese is what I consider the finest and most entertaining way to dine. Accompanying the meal are refreshing, light, healthy appetizers. Tradition also dictates banchan, the kitchen’s choice of vibrant, colorful, seasonal side dishes (fresh, fermented, or cooked), to complement but not overpower the meat. Sip a slushy shoju along with your barley tea, and you have a spirited party. Korean barbecue combines the best of street food (cooked in front of you) and fine dining (at a detailed, set table with delicate dishes), and turns every meal into a memorable ritual. Jackie Yoo uses her decades of experience in the meat industry to showcase the finest and most humanely raised meat at her restaurant, StarKing Korean BBQ in Los Angeles. As a native-born Korean growing up in Beverly Hills, she developed a passion and interest in all foods. Jackie is dedicated to introducing the traditions of Korean cuisine and how it fits into the contemporary culinary scene to her son Grayson.